Dirt Merchant Bikes has an XCR Air 24 fork available for demo in the Seattle area. Contact us at 425.429.0865 for details and to reserve a demo. 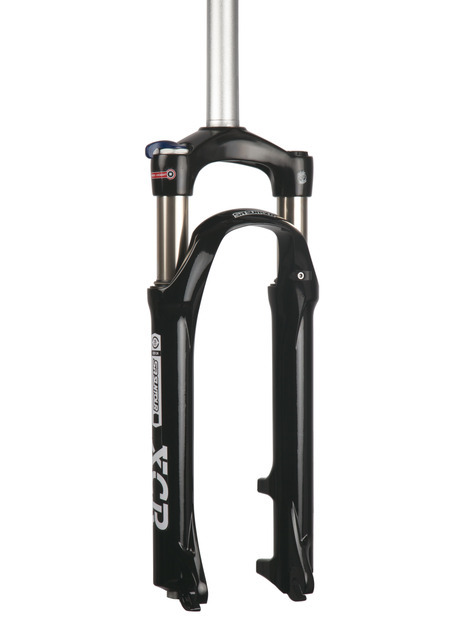 For 2016, SR Suntour has released an all-new version of their XCR Air fork for 24” kids bikes. For the new version, SR/Suntour switched from a single air/damper cartridge to a larger air chamber with a standard prefixed rebound lockout cartridge. The negative spring has also been changed to a softer spring rate. As with the previous version, the current XCR Air has an alloy steerer and magnesium lowers for reduced weight. Compared to the previous model, the new fork is more sensitive and better tuned for the low air pressures needed for smaller riders. The larger air volume reduces end of stroke ramp up to allow lighter riders to more easily access the fork’s 80mm of available travel. The new XCR Air fork has worked really well for my son. With the larger air chamber, the air spring curve is very linear allowing lighter riders to easily access all of the fork travel. A more linear spring rate means that the firmness of the air spring remains relatively constant through the fork’s travel while a more progressive spring rate means that the air spring becomes firmer as the fork goes through its travel. At 45 psi in the air spring, the fork had a good balance of initial plushness on small bumps with a good level of mid stroke support. At this air pressure, only large bumps bottomed out the fork. Typical riding on flat but slightly rocky trails uses only about ½ of the fork travel. One other reason why I decided to get the SR Suntour fork is that SR Suntour has a US distribution and service network. The other competitors in the kids air fork market (Spinner and RST) don’t. Availability of parts and warranty service from SR Suntour in the US seems good. I like SR Suntour’s new XCR Air fork a lot. At a very reasonable price, it does everything I expect an air fork for a kids’ bike to do with great build quality.